This is a really important issue for clients relaunching their websites and changing their URL structure - and it's unfortunate how many get it wrong or don't know they need to do it at all. "Did you do your 301 (permanent) redirects? AND, did you check that they were working correctly?" Essentially, when you have an existing site with backlinks to it you want to make sure you retain the value of those links. If all of your page URLs stay the same in your redesign then you should be fine - but if they change and you don't tell the search engines where the new 'home' for these pages is, then the value of any inbound links will be lost as Google (and other search engines) can no longer find the pages. If you don't tell the search engines that this is the new page URL (via what is called a 301, or permanent redirect) then they can no longer find that page and the link benefit no longer gets passed to your site. Your site will also generate 404 (page not found) errors. The result is a loss of traffic to a page that was once getting lots of pageviews. Plus, there will be a loss of valuable SEO benefit as the inbound links now point to a page that no longer exists. If the same thing happens for multiple pages on your website, the result can be a huge decrease in traffic, a significant loss of SEO value and a drop in organic rankings. So it's crucial when at the planning stage of your relaunch that you think about how you will deal with any redirects. Also make sure that you test them once they have been done. It's not uncommon to have to re-do redirects and ensure that they are working properly - don't just take your web developers word for it (no offence web developers!). Use a tool to check them (there are a number of these tools available online). Or at the very least test some of the URLs manually to make sure that they are redirecting as you would expect them to. It is definitely worth taking the time to do this! 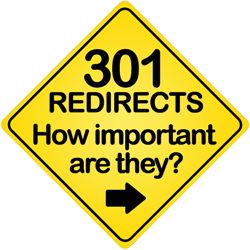 So, have you had any problems implementing your 301 redirects? How has your new site launch gone? Has traffic to your site been maintained since launching the new site? Or are you thinking about a redesign, but aren't sure what the impact will be on your site? Contact me today for help with redirects and other critical aspects of relaunching your website. © Copyright E-Tail First Consulting 2010 - 2019. All logos and trademarks are the property of their respective owners.